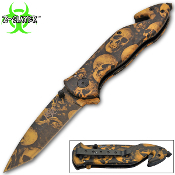 Assisted Opening Rescue Pocket Knife w/ Brown Skulls Handle - This official Zombie Slayer rescue pocket knife is useful whether you're in the Zombie Apocalypse or just gearing up for impending doom. Spring Assisted - Press the index or use the thumb stud, and it flies open and "snaps" in place via the sturdy liner locking mechanism. The razor sharp tanto style stainless steel blade features a the Z-Slayer logo. A belt/pocket clip on the side of the handle keeps your zombie rescue knife at the ready to get out of sticky situations. The razor blade seat belt cutter and skull crusher/window smasher point make this a valuable rescue tool for use in an emergency. This Zombie Slayer pocket knife may just become your best friend during the apocalypse.